The following is an alternate range of basic terminals and reflectors to suit non highway applications. The terminals are ideal for Car Park and Warehouse applications where low impact or cosmetic applications are required. The terminals provide solutions for limited space, right angles, human protection and budget requirements. 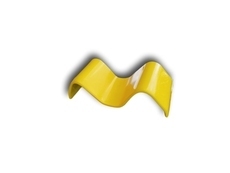 The reflectors provide simple soltions for highlighting barriers and terminals in hazardous locations.